A space ship full of monsters. Whatever shall you do to them? Chillingo's D.A.R.K. is one heck of a game. Currently available for the iPhone, this third person shooter casts you as a member of D.A.R.K Squadron, charged with investigating the USS Storm Bringer to find out what happened to the crew. We'll give you a clue: something terrible. As expected, the mission goes to hell, things explode and our heavily armored warrior is up to his eyeballs in zombies, aliens and spider droids. What is a gun toting space marine to do? Blast them to smithereens. D.A.R.K. 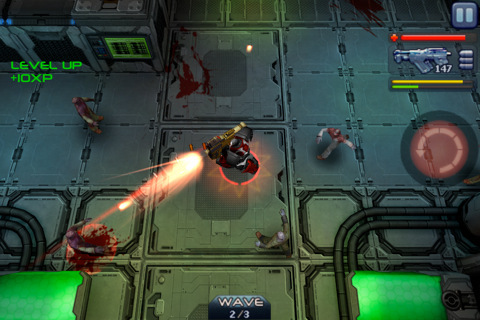 was clearly inspired by Team 17's Alien Breed and that's perfectly fine, since it is a thoroughly enjoyable blast fest with sharp looking graphics and a small collection of high-powered weapons that level up over time. There's a standard automatic rifle with unlimited ammo, laser and mini guns and some toys we'll let you discover on your own. In addition, you can purchase armor, bullets and health packs via shops scattered throughout the ship. Thankfully, the developers put a whole mess of them into the game, which should help keep those guns fully loaded. That said, there's little here we haven't seen before. Chillingo spices things up with the ability to control a bullet spewing mech, but for the most part, the App follows the same pattern: explore new rooms, activate switches, kill waves of bad guys and repeat. Of course, that doesn't stop D.A.R.K. from being monster-splattering fun. Sure, it plays like countless games that have come before it, but this action fest will keep you glued to the iPhone for hours, thanks to its addictive combat, detailed visuals and dramatic score. Three bucks well spent. What's Hot: Plenty of enemies to blast, attractive graphics, dramatic audio, responsive virtual stick controls, nice variety of weapons. What's Not: A bit repetitive.